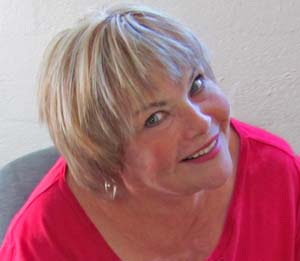 First thing on Tuesday I had my hair done with a blond ash weave and cut short. My hair grows fairly fast and my hair had really darkened over the past five months. I wasn't a walk-in and had a little time to talk to my dear husband, Steve, about what style he liked and so on. It wasn't hard for me to go blonder. Teresa on 8th Street did for me. She doesn't speak English and I don't speak Spanish, but she knows the word, "sassy" and that's what I got. Teresa did the color twice to make sure the blond was not gold or brassy and I appreciate her making sure it was just what I wanted. Her daughter told her I wanted a Japanese Anime haircut. It's just a pixie. I didn't want to go darker to cover the gray and oh my gosh, I feel like an old lady going blond at 60. At least I'm not a "blue hair" yet. This haircut was a fun updated look but without the famous "Utah Prairie Chicken" spiky-stuff in the back. Almost everyone is sportin' that haircut. Is that just Southern Utah or is that the WHOLE state of Utah? My two girls living in Utah will never, ever go that route. They are freaked-out by it. I think the show, "Kate and plus Eight" a couple of seasons ago, started that look. Since my hair had changed so much, way more blond and short..I had to put a new Facebook profile picture. How would everyone recognize me now in real life? And, of course, I needed a red Christmas shirt not a Fall color orange blouse, right? The posts and comments filled my profile page and went to bed thinking about my beautiful hair and then a little on the news about the Prince William and Kate engagement. Honestly, I didn't know he had a girlfriend. It must have made an impression on my brain, somehow. I slept on the notion that Kate was being taught all the Royal Etiquette. I woke-up and hurried and looked in the mirror for any sign of "Prairie Chicken" My hair looked great. I felt beautiful and cute and full of energy. I was stronger, brighter, and full of fun. I threw the ball for the dog over and over. I fed the animals and really danced goofy from pen to pen, making my hair jump as I jumped, and waving my hands around like Miss Guatemala. I was kissing my loveable animals saying "hello" with lots of love and feeding & watering. 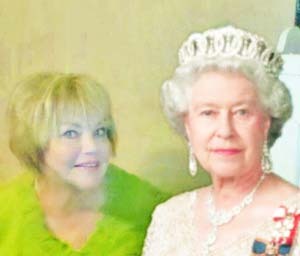 And right (wrong) in my mind, I'm daydreaming of meeting the Queen of England. I can curtsy. Dang! Queen, are those real jewelry? The day was a beautiful. A true "run-away-day" Steve was still at the station for one more shift. I felt so glorious. All my animal friends saw me and smiled immediately. Yeah, it was the food, but the day was as a new as a Spring morning. I was strong. Hercules got a hair-cut and turned weak, but me...I was strong. I decided to clean the goats and sheep water troughs. I dumped the tubs out of the pens, so that the animals didn't get their feet wet and the ground muddy. The water seemed full of lumps of poop and debris. The wet alfalfa at the bottom of the troughs was slimy alfalfa. The ground sloped and the water ran toward the empty horse pen by the side of the kennel. Water pressure out that way, is poor. So, while I refilled the sheep and goat water with all the cleaning done, I decided to sit in my favorite throne heavy plastic chair. I was going to pass the time by watching the animals run and play the "pecking order" game of who had the greatest right to the best pile of alfalfa. I was enjoying the fresh air, light warm breeze, the view of the Santa Paula Peak, and the beauty of the ranch. I tippy-toed around the the muddy, green water and reached the chair and still playing with our dog Darby, the never-ending... obsessed fetch game. I was thinking I'm so pretty~~a little West-Side Music here. I walked with a hop over the mud and plopped my royal rear down on the chair seat and just as I leaned back, it broke instantly. I can only think, exploded. I rolled-out of the chair and in slow-motion, I went right into the yucky, green-brown river/puddle. I wallered in it trying to get-up so no one would see me and thinking to myself, "What just happened?" It was all so slippery and I pulled myself up by grabbing on to the fence. Oh, I looked at myself. My hair was filled with mud and slime, my clothes were all covered with real dirty water, even my church shoes, were covered. Why did I wear my nice clothes to do chores? I was in weird-land. I looked at my phone in my pocket it was okay and then I looked the chair. I was so cold. I knew then, God sent me an important message: That was the "humble chair" I needed to be brought down! There it was. I still need a lot of work and really I'm not even cute. 60? 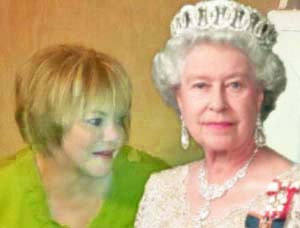 I'm not going to meet the Queen. Yes, the answer is: "I am what I am" like Popeye the sailor. I took a shower and hurried off to my swimming class. I did get a few mentions about my haircut and color, but not anything like Facebook. We just did our usual socializing, exercising, and having fun. It was a normal day except I learned a lot and laughed at myself. This whole vision that I had, was a great lesson to me. 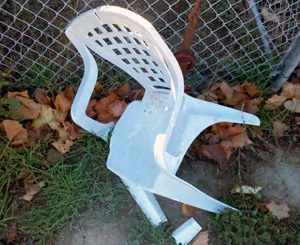 A long time ago I would have saved the broken chair, but I took a picture of my "humble chair" I wasn't hurt and my pride, not at all. It was completely funny and I laughed all the way to the facet to turn-off the water that was overflowing in the pens, now. My bubble was burst, the daydream was over, and I had a reality check that made it all short-lived and never had a chance to become part of my ego. Hey, there's a paper bag, I think I'll just put it over my head and walk in the house. Oh Mom....you make me laugh! I loved reading this one. You are cute even at 60...you will be forever. I love you and your stories!! !